Kemble's Cascade lies in a region of sky that is sparse of bright stars. 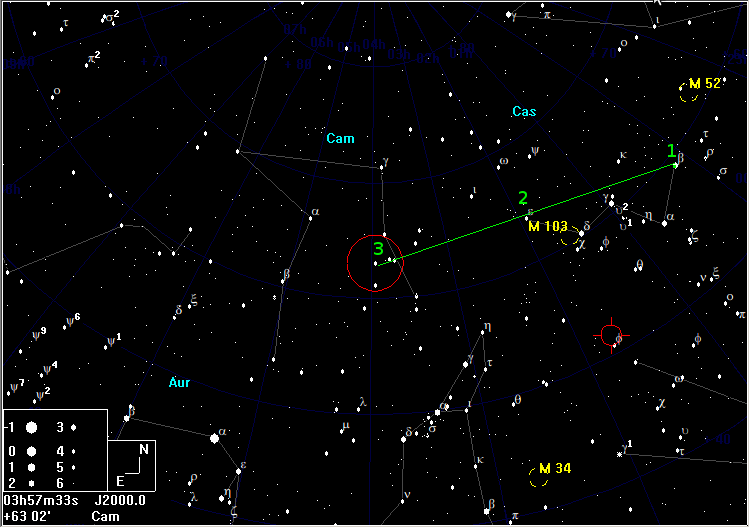 If you are confident of identifying the 4th magnitude α Camelopardalis in your skies, simply find the 5th mag star that is a little more than half a 5° field to the SW, then continue the same distance to the SW. If α Cam is not visible or identifiable, Take a line from β Cas (1) through ε Cas (2), and extend it the same distance (3) to the Cascade. This beautiful chain of stars, named for the late Canadian amateur astronomer, Fr Lucien Kemble, is one of the northern sky's finest sights in medium-sized binoculars. 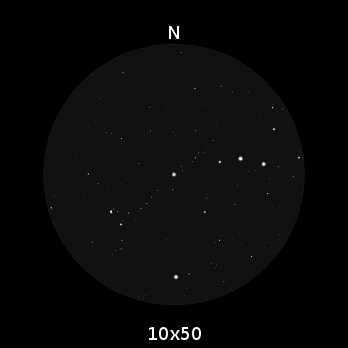 It is a ribbon of stars down to 9th magnitude, more than a dozen of which can be visible in 10×50 binoculars, that extends from NW to SE across a 5° field, with a brighter (5th mag) star near the middle and the small open cluster NGC 1502 at the SE, which is the 'pool' into which the 'cascade' appears to 'fall'. The magnitude given is for the fainter stars. The brightest star is magnitude 5 and NGC1502 is magnitude 6.9, but you need to be able to see the fainter stars to appreciate the asterism.